The time interval can be of any length spanning minutes, hours, days, weeks, months or years. However, if we are focused on candle patterns most traders are interested in candles made from intervals not longer than one day. It is common to find OHLC representing the order for displaying the prices (open, high, low, close). The single candlestick is composed of three elements: upper shadow (jap. uwakage), lower shadow (jap. shitakage) and body (jap. jittai). The Candlestick body is determined by the opening and closing prices, represented by a rectangle. The color of the rectangle differs, depending on whether the opening price is higher or lower than the closing price. If the closing price is higher, which means that over the time interval we had an increase in price, the candle is referred to as a white candle. If the price decreased over given time interval, that is, the closing price is below the opening price, the candle is referred to as black candle. Traditionally, the Japanese used black and red. However, nowadays it is more common to use black and white or, if the candlestick is filled with color, is deemed to be decreasing candlestick (closing price below the opening price). Alternatively, if the candlestick is unfilled this indicates growth (closing price above opening price). Sometimes, filled red candles are used to denote a bearish candle (closing price below the opening price) and a filled green candle denotes a bullish candle (closing price above opening price). 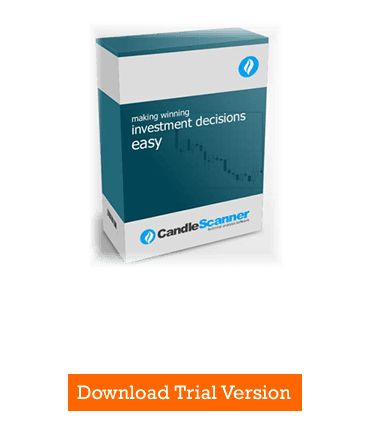 In CandleScanner the user can customize the look of the candlesticks in many ways which best fit his/her preferences. 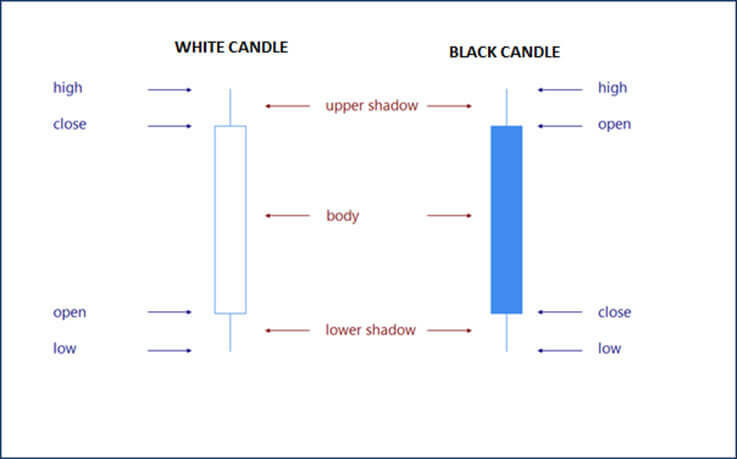 The Figure 1 shows the elements which make-up a candle and how it is drawn, depending on the relationship between the opening and closing prices.